SCVHistory.com LW3194 | William S. Hart | Hart and Margery Wilson in 'The Return of Draw Egan,' Publicity Still, 1916. 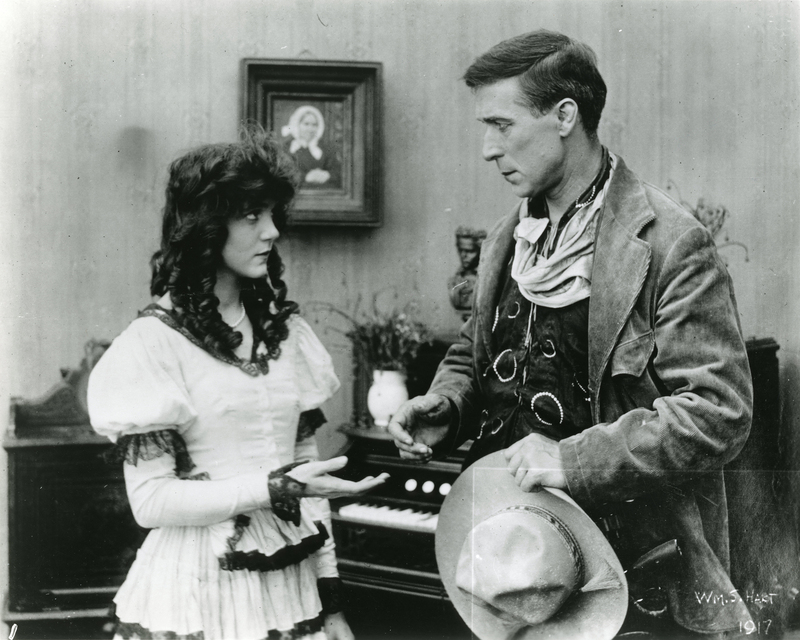 "The Return of Draw Egan"
Margery Wilson and William S. Hart are featured in 1916's "The Return of Draw Egan," widely considered one of Hart's best films. The same ubiquitous publicity image was used in the promotional lantern slide. The meaning of the 1917 date, evidently written on the film negative, is unknown. The movie premiered October 15, 1916, in the United States, and in 1918 in Europe. About "The Return of Draw Egan"
From Koszarski (1980:53): Produced by Triangle/Kay-Bee under the supervision of Thomas H. Ince; distributed by Triangle; in production April 29-May 24, 1916; released October 15, 1916; © as a reissue by Tri-Stone Pictures, May 25, 1924; production cost, $13,307.65; also known as "The Fugitive;" five reels. Directed by William S. Hart; story and screenplay by C. Gardner Sullivan; photographed by Joe August; art director, Robert Brunton; assistant director, Cliff Smith. CAST: William S. Hart ("Draw" Egan/William Blake); Louise Glaum (Poppy); Margery Wilson (Myrtle Buckton); Robert McKim (Arizona Joe); J.P. Lockney (Mat Buckton). SYNOPSIS: With a price of a thousand dollars on his head, "Draw" Egan, captain of a band of outlaws, escapes with Arizona Joe from a burning cabin in which he is cornered. They separate. The impression goes forth that "Draw" Egan is slain. Yellow Dog is a town wherein the bad element has been running things with a high hand. The reformers under Mat Buckton cast about for a fearless man to rule the community. When "Draw" Egan shows up on the horizon he attracts the attention of Mat Buckton, who persuades him to take the position of sheriff. "Draw" takes him up. LW3194: 9600 dpi jpeg from 8x10 copy print purchased 2018 by Leon Worden.